Mazda's engineers developed the brake system on the NC Roadster for improvements to linearity, response, and control. The car still uses front and rear disc brakes but now there are reductions in the amount of play in linkages and the pedal ratio is reduced from 4.1 to 2.9 for improved feel. The front discs are a ventilated type and increased in diameter by 20mm to 290mm with a disc thickness of 22mm. The rear discs are a solid type and increased in diameter by 4mm to 280mm with a width of 10mm. Rear calipers are made from aluminium to reduce weight. The brake balance of the NC was shifted more towards the rear and an improved electronic brake force distribution system helps make the rear brakes work harder than the previous generation without locking up. To provide extra help under heavy braking the NC's vacuum booster increased in size by 25mm. To further improve feel the flexible brake hoses use a stronger reinforcement braid to reduce swelling and brake fade under heavy braking. Thanks to increased brake power, revised suspension geometry, larger tyres, and only a small increase in weight, the NC's overall brake performance is a significant improvement over previous models. The NC3 revisions further optimised the brakes with upgrade to the brake booster system. If the standard setup isn't enough then there are options for further improvements. Several other Mazda models use the same wheel PCD and bore and thus brake disc fitment. The Mazda 3 MPS, 6 MPS and RX-8 uses a large 320mm front disc and it's possible to fit these larger discs. You'll need the calipers and pads too but this upgrade is ideal for a powerful trackday or fast road car. 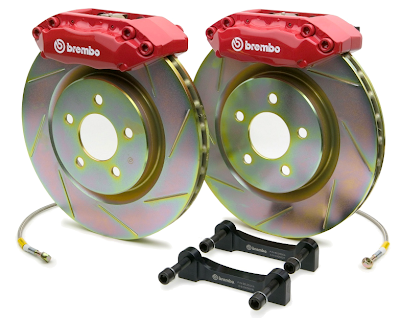 There was a Mazdaspeed front brake upgrade kit designed by Brembo available in the USA. This kit included large red Brembo calipers (RAMS-8M-D18), upgraded brake pads (RAMS-8M-D15), 310mm slotted discs (RAMS-8M-D16) with anti-corrosion zinc plating, and a pair of braided brake hoses (RAMS-8M-D17). The calipers were aluminium and were a 4-pot design. The part number for the whole kit was RAMS-8M-D12 and it retailed in the region of $2000. The same big brake kit is also available from Brembo (part number 1A5.5016A) where it is part of their GT upgrade range. Prices are around £1300 for the kit.